We can see the end of our journey quite clearly. In less than four weeks we’ll be back in our beds, and snuggling in with our dogs and our cat (well, not our cat because she doesn’t do that sort of thing). Perhaps that’s why the first thing we did when we arrived in Berlin was to go for Mexican food. When we lived in Japan we used to take a two hour train ride into Tokyo to eat at El Torito so that we could have Mexican food that was bad even by El Torito’s standards. But it made us happy because it reminded us of home. That must have been on our minds when we arrived here and were willing to spend ten bucks on a cab to take us to a Mexican takeout joint in Berlin. It was actually pretty good, considering the circumstances, but it was the symbolism of the act more than anything else that struck me. We’re winding down. We’re starting to think of home. Does that make us bad people? I certainly hope not. This is not to say that we spend our days huddling in the corner of our apartment, pining for the fog and the drought and the beginning of the presidential primary season. No, friends, we’re travelers and travelers travel. Throughout this trip, we have tried not to look too far ahead for fear of cheating the present. It’s getting a little harder not to look ahead, but we’re going to give it the old college try. Herewith, then, are highlights of our relatively brief visit to Berlin. We squeezed Berlin into the schedule because people just kept talking about it. It’s a new and vibrant city, people say. 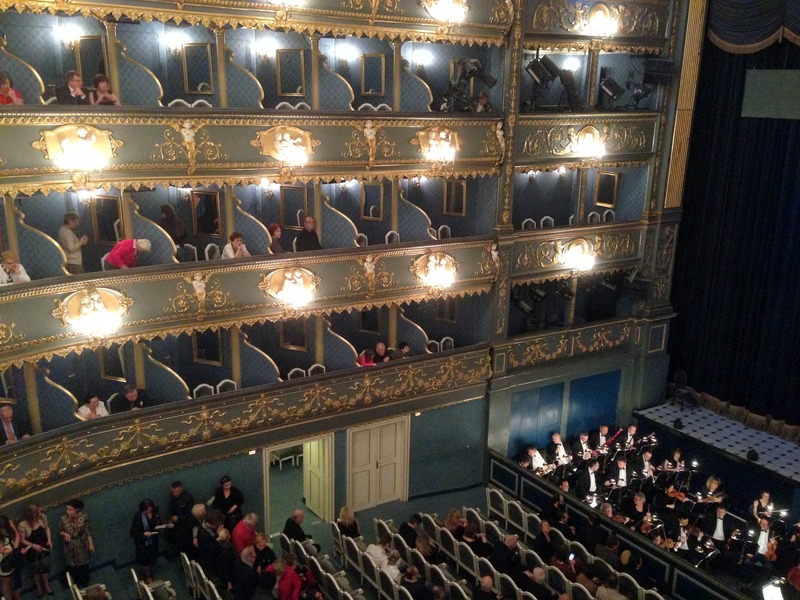 There’s opera, ballet, one of the best symphonies in the world, and an exciting new art scene. All those things may be true, but what has struck me about Berlin is the wall. Of course the wall is gone. People wiped it away because it was bad. It divided a country, it divided families, and it was a terrible symbol of the stark difference in the lives of people from the same country who in some places lived just a few hundred feet from each other. Walking around Berlin today it’s hard to imagine that twenty five years ago there were one hundred twenty four miles of wall encircling West Berlin, whose purpose was to keep the population of East Germany out. Our apartment in Prenzlaur Berg sits on the east side of the dividing line, just one block from where the wall used to stand. A casual visitor to the neighborhood couldn’t possibly tell that this was the poor side of town. There are malls, cute little cafes, movie theaters, and yes, Mexican restaurants. A time traveler from 1989 would fall over dead. Maybe the most famous symbol of the border between east and west Berlin is Checkpoint Charlie – one of the few spots where people could cross from one side to the other. Of course it was impossible for regular East Germans to make the trip to the west, but westerners were allowed to cross, as were diplomats and other credentialed people. There’s nothing original left of the old gate (the real one is in a museum, so visitors have to satisfy themselves with taking photos of a replica, including the famous “you are leaving the American sector” sign). No matter, the fake gate looks real enough, and it’s not hard to imagine the tension inherent in two cold war powers staring each other down across a short no man’s land. 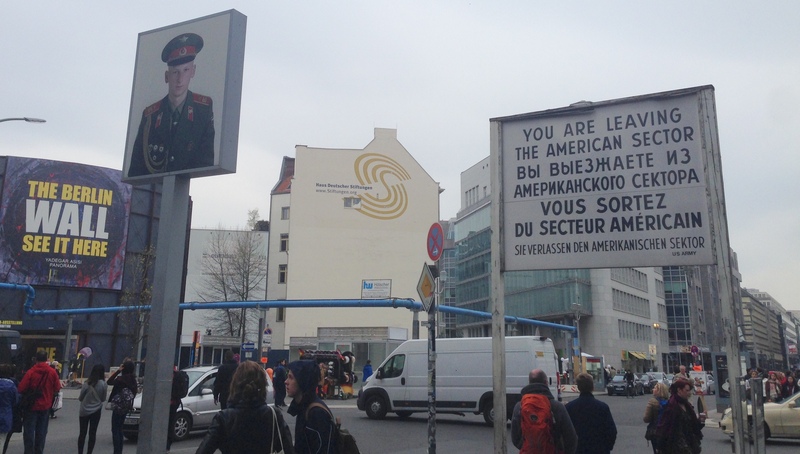 There’s almost nothing original left at Checkpoint Charlie, but it is still a place where many people lost their lives trying to escape to the west. If you have trouble conjuring up the image, there are no shortage of exhibits and museums that will fill in the blanks. The cheesiest is the DDR Museum – a kitschy exhibition of life behind the iron curtain. There you can sit in a Trabant, which was considered one of the world’s worst cars, but which was a symbol of East German engineering. (It famously didn’t have a gas gauge, as designers believed that what didn’t exist couldn’t break.) There is a replica of a standard-issue East German apartment (although I’m sure a great many New Yorkers would trade their hovels for one of these places, as long as they were still walking distance to Zabar’s), and some snarky displays about life in the East. It also included, inexplicably, a display on East German’s love of nudist camps, complete with a bizarre diorama. A diorama of East German nudists playing volleyball – truly the weirdest museum exhibit I’ve ever seen. The whole museum is a bit of a victory lap, but it’s an informative and entertaining one. The shocking bit is that until 1989, a time that many of us remember quite well, that’s what life was more or less like in the very neighborhood in which I’m typing these words. Now I can walk across the street and get a latte. One of the great symbols of Berlin is the neo Baroque Reichstag building. The building was the home of German parliament from 1894 to 1933, when it burned under mysterious circumstances. After World War II, the West German government moved to Bonn, and the building sat here, unloved and disintegrating. An attempt at restoration in the 1960s was a bit of a bust, but German reunification in 1990 provided the impetus to restore the building properly as the seat of government was returned to Berlin. The British architect Norman Foster reimagined the building in very good ways, replacing the destroyed cupola with a glass dome, from which you can look all the way down into the legislative chamber. The bad news is that you need a ticket to get into the dome (although the tickets are free) and when we arrived to Berlin, the tickets were all gone. The good news is that there is a glorious loophole to the ticket problem. There is a restaurant in the dome and anyone with a reservation to the restaurant naturally gains access to the dome, so we went the loophole route. The bad news is that the food and the service aren’t quite as good as the view. But the good news is that the view and the free audio commentary provide a great vantage point to see the city and learn about its history. 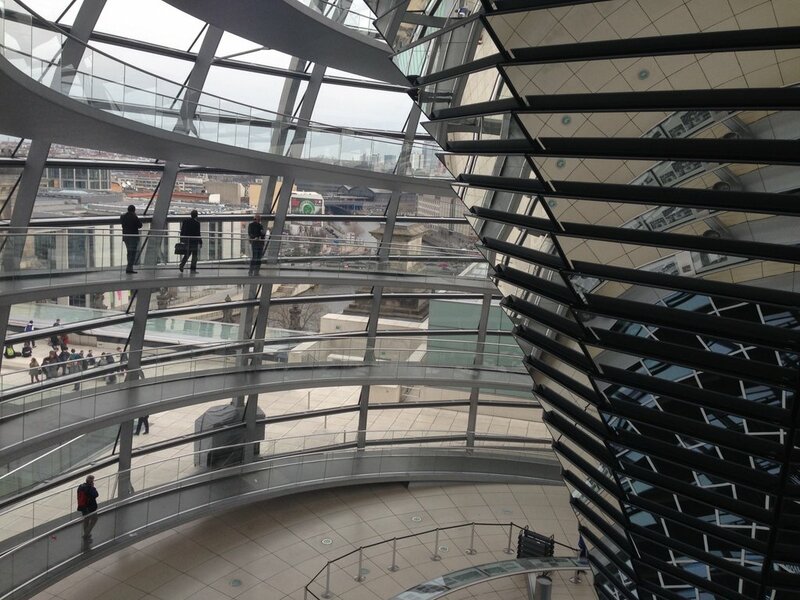 The funhouse mirror effect of standing in the dome of the Reichstag. We also made time for the Bauhaus Archive, which displays a collection from the famous school of art and design, where so many modern design ideas got their start. From furniture to architecture to everyday household items like lamps or even chessboards, Bauhaus designers created work that was meant to be inexpensive to produce, practical to use, and beautiful in its simplicity. Much of today’s so-called “design thinking” owes a huge debt to Bauhaus, as does the architecture of Frank Lloyd Wright, and almost every Airbnb apartment, furnished as they invariably are at Ikea, which is full of Bauhaus-inspired stuff, whether they realize it or not. 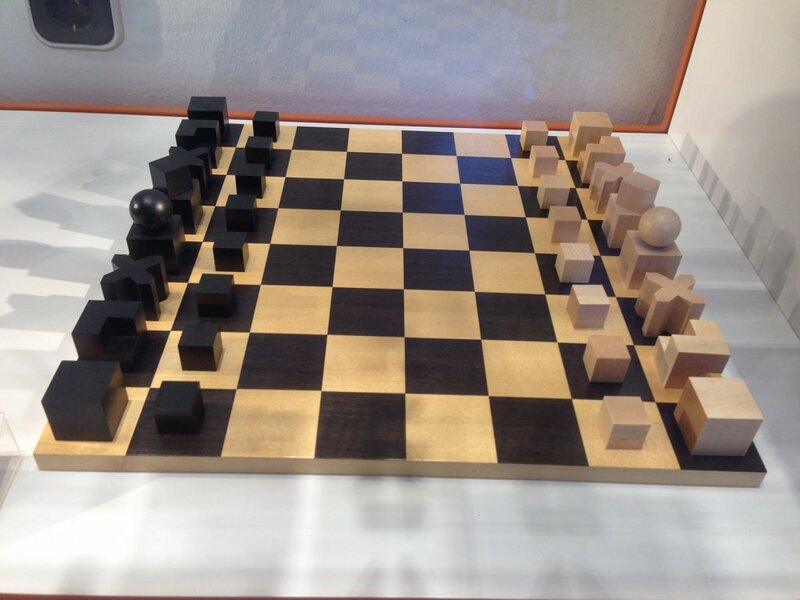 A Bauhaus chess set – the pieces tell you how they move. Two meals stood out during our visit. The first sounds awful but was really, really great. At the advice of a friend of Janine, we skedaddled over to the Kaufhaus des Westens (the department store of the west), more popularly known as the KaDeWe, a department store that has served Berlin in one form or another since 1907. Department stores are fine, but this one has a food hall that makes it a real destination. There are counters sprinkled around the sixth floor in between butchers, fish mongers, and sellers of wine, produce, and other good stuff, including, by far, the stinkiest cheese display I’ve ever laid nose on. The counters serve up an equally wide array of gourmet goodness, and after much consideration, we settled on a food counter that specialized in, of all things, potatoes. Janine had a baked potato the size of a basketball, and I opted for pickled pork in aspic served with thin sliced potatoes that were cooked in bacon and onions. Our stools at the counter provided us with the perfect vantage point of the dish as it was being constructed. A chef would ladle some liquid lipid into a pan, then he would toss in a big pile of sliced potatoes, then some bacon and onions, then more viscuous grease, and then cook it until the whole pile was brown and delicious and deeply dangerous. The dark brown German lager with a foamy head like a dirty blonde afro rounded out the dish, and my silhouette. If I keep eating like this, I will be in no condition to either bicker or love. 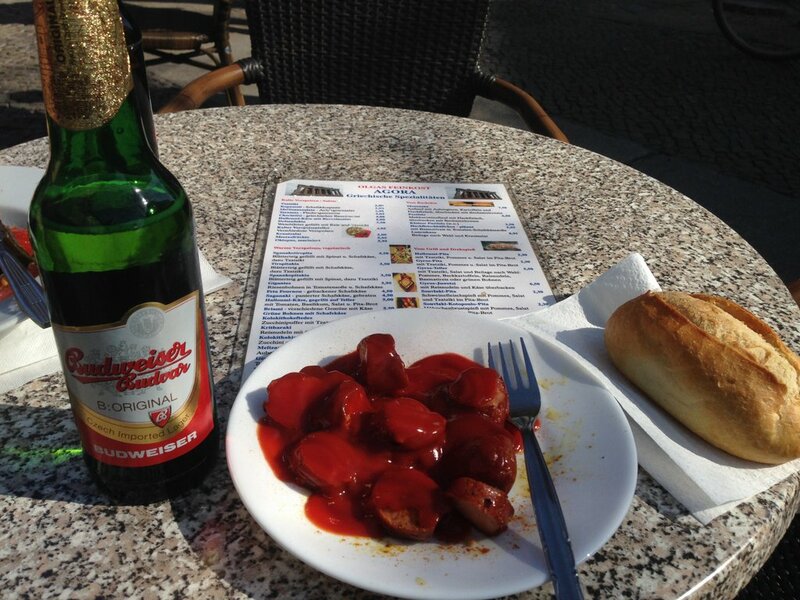 And now a word about the second meal, Berlin’s most famous food item, currywurst. The word is…meh. 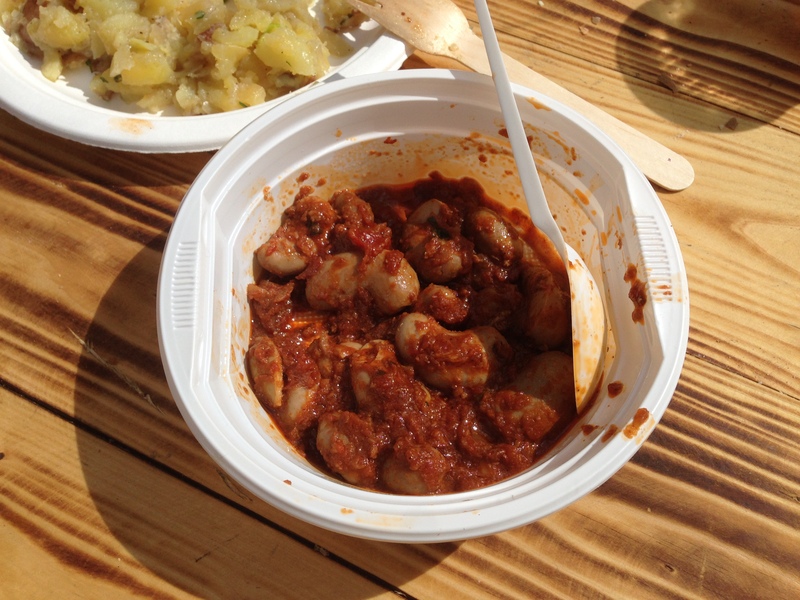 Currywurst is simple, but this is a reminder that simple isn’t by definition good. Currywurst is a hot dog cut up into inch-long pieces, sprinkled with curry powder, and drowned in ketchup. It was fine, if you like that sort of thing, but honestly I just don’t see what the big deal is. On the other hand, I saw a guy selling hot dogs from a portable grill that was hanging around his neck. Now THAT’S dedication in service to an important cause. More grilled hot dogs, I say, and less currywurst. And so, having not nearly done Berlin the justice it so richly deserves, we pack our two bags and make for Wales, where we will visit our dear friend Mark and try to convince him that Wales needs to buy a vowel. After that we are off to Scotland and then London, and then home on May 11. Hard to believe. Everybody says go to Prague. Friends, acquaintances, enemies, whatever. Nigerian email scammers offer to let you in on this great opportunity to hold their eleven million dollars, and then they extol the virtues of Prague as a vacation destination. Babies in their strollers give it two tiny thumbs up. So?? How’s Prague? Does it meet these outsized expectations? Yep. Prague is pretty damn good. 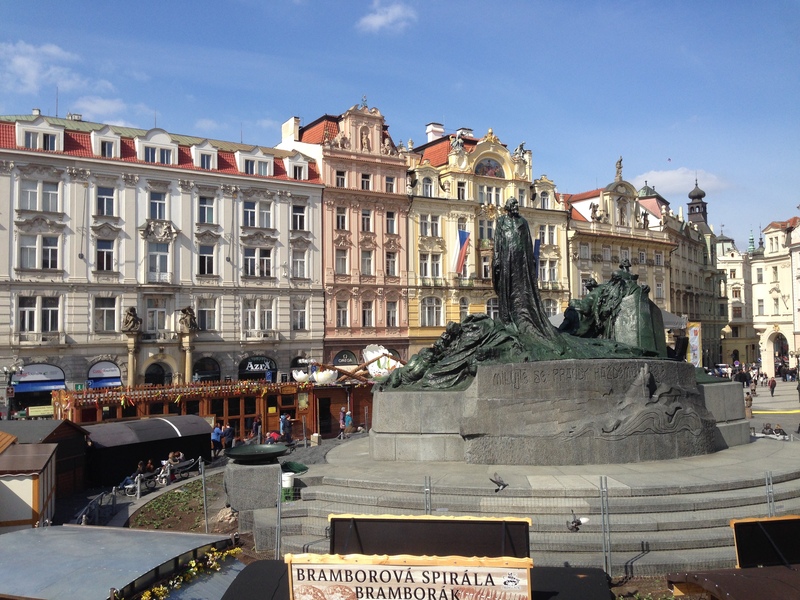 What’s so good about Prague? Where do I begin? Pick an architectural style and Prague has it in spades – gothic, renaissance, baroque, Art Nouveau, Deco, and even some entertaining but hideous Cold War communist structures. With the exception of a bombing raid that was meant for Dresden but hit Prague, the city made it through World War II almost entirely intact. You could do nothing but wander the old streets, look at the buildings, and be pretty happy. Typical cliche architecture in Prague. The Estates Theatre, where Amadeus was shot, where we saw a funky dunky Mozart singspeil called The Abduction from the Seraglio. There are a bunch of funky jazz clubs, a few puppet theatres (could be creepy, but I’ll offer the benefit of the doubt) and something called “black light theatre”, which came out of the sixties, in which the use of black light allows performers to create what can best be described as live-action animation. They have a really impressive art museum that seems to be all but unnoticed, which is a crying shame because it’s stuffed with all those famous names we’ve come to know and love – Picasso, Van Gogh, Monet, Seurat, Chagall, Klimpt – and a long list of Czech artists that you probably haven’t heard of but who were holding their own alongside many of these folks. It also has a wing of contemporary art that is great once you get tired of looking at all that fancy stuff. And then there’s the food. 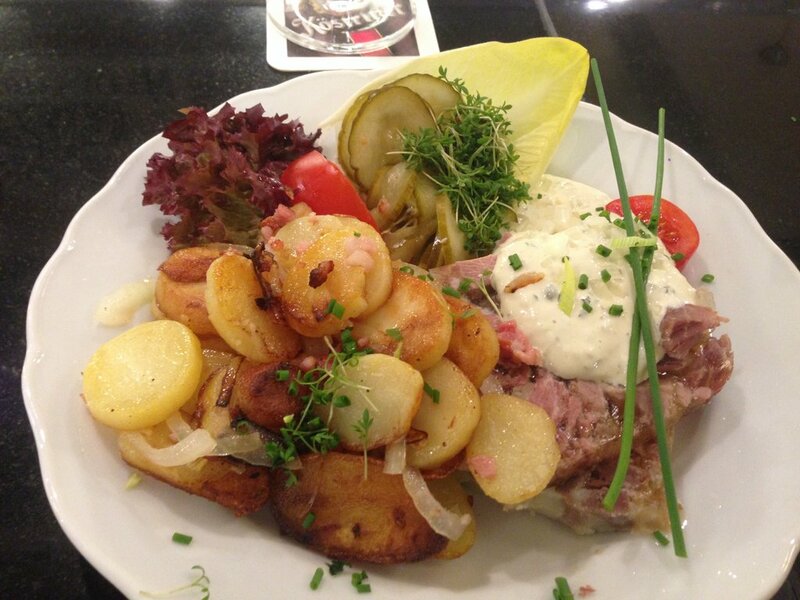 Let’s face it, central European food will kill you if used as directed, but that’s usually what makes it so good. 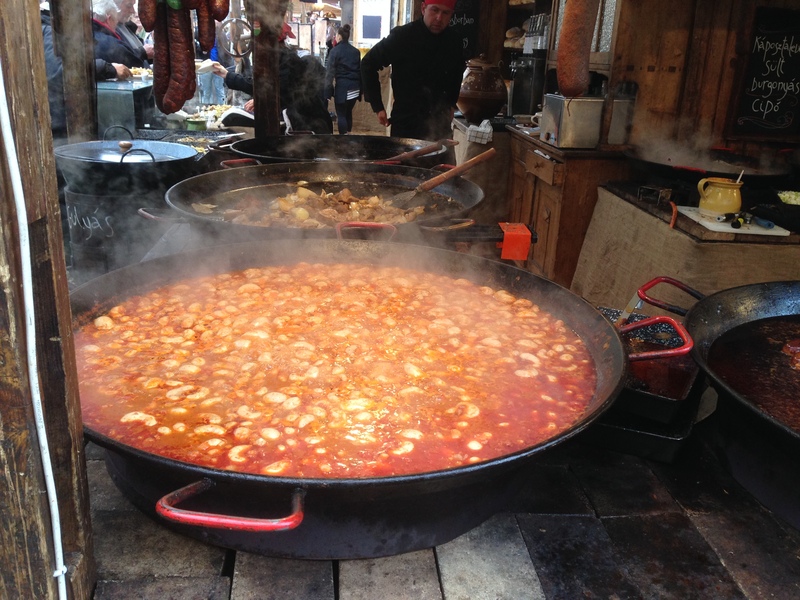 As in Hungary, the Czech diet is heavy in soups, stews, massive bread or potato dumplings, sour cream, and huge hunks of pig, usually washed down with copious amounts of beer. This is a terrible place to start a diet, but a great place to end one. But where to begin? We had been here a day or two when I realized how much I envied Anthony Bourdain. After all, he gets paid to travel around the world and eat and drink stuff, but he also always has some local foodie by his side, holding his hand, and taking him to the best place for blowfish, or guinea pig, or whatever. I believed these folks are called “fixers” in the travel show business. Well, I want a fixer! Why should we have to make all the arrangements? Why should we do all that web surfing and trial and erroring? Why can’t we have a fixer like Bourdain? It turns out anyone can have a fixer. Fixers are everywhere. They’re called tour guides. But average workaday tour guides just give tours. Sometimes they’re even counterproductive. They take you to glorified souvenir stands where you’re expected to buy stuff, which is just awkward for everyone. We needed someone better than that. Someone who would take us places, feed us stuff, and who knows what’s really, really good. A person like this would talk to us, laugh at our lame jokes, and be our friend (for a small fee). I guess what we were really looking for was a culinary concubine. Well, I’m sure you’re all screaming at your iThingys right now, because the solution was so obvious. Just go on an eating tour. Every city has one. An eating tour is even better than a hop on, hop off bus. Some nice person will take you around town, feed you all the best stuff, liquor you up, and unlock all the secrets of your new city. If you’re lucky, they’ll give you their business card and tell you to just send an email if you need any more recommendations during the rest of your stay, and they’ll mean it. Like the man who discovers the joys of golf on his eightieth birthday, at the end of our long adventure I have finally figured out a dead easy way to get started in a new city. Take a food tour, dumb dumb. 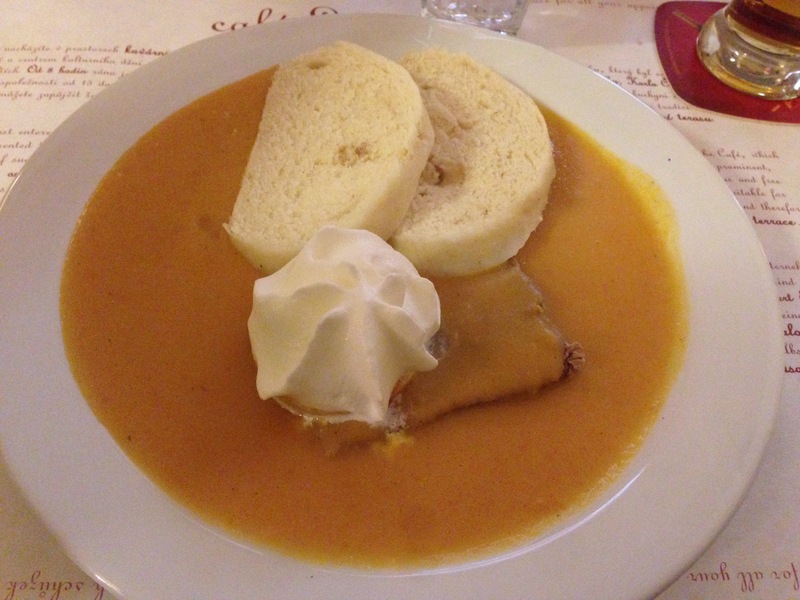 I was doing a little web research on Prague and stumbled upon something called “The Food Lover’s Guide to Prague,” and holy sweet mother of pearl was that a good idea. Our new best friend, a hip, friendly, voluble fellow named Jan, was just the ticket. 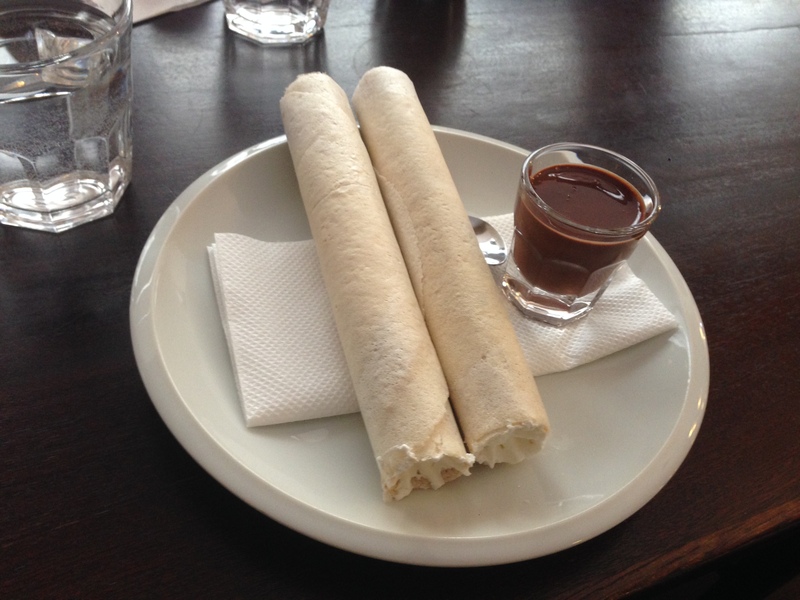 He started our tour with a classic Czech dessert, called a hořice, a rolled wafer stuffed with whipped cream which comes with a warm chocolate sidecar for dipping. It was a bit unconventional to start our tour with dessert, but I was game. Priming the pump with horice, thin-rolled wafers stuffed with whipped cream. Next we strolled through the old part of town a bit and made our way to a place called Sisters, which serves something called chlebičky, which are fancy little open-faced sandwiches. 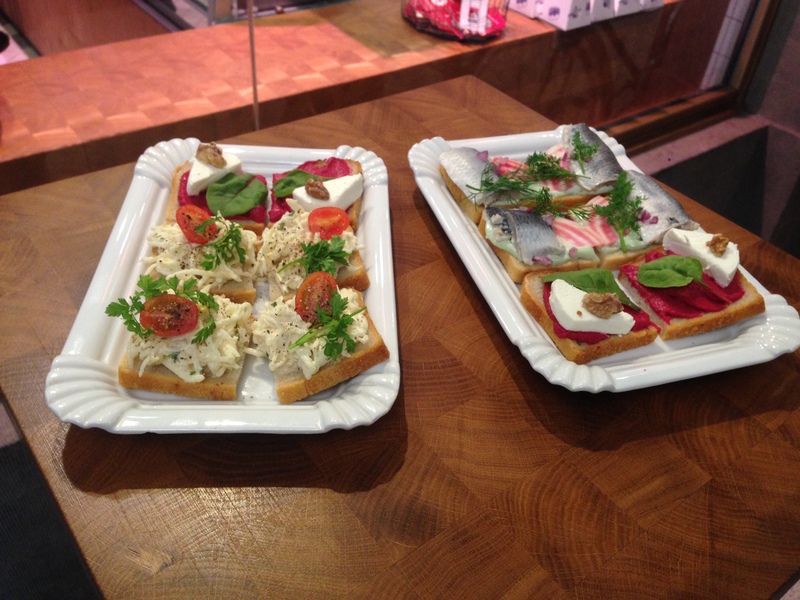 Ours had the first good version of pickled herring I’ve ever had, as well as a very nice whipped beet spread with goat cheese, and a celery root slaw sandwich. Next door was a butcher shop called Nase Maso, (which translates to “our meat.”) Well, Czechs like meat, but these guys really like meat. This is a post-modern butcher shop where the staff is young and attractive and the butchers visit the farms and go pet the pigs before they are invited to the great beyond (and then your plate). We had two kinds of ham, a spicy sausage, and a delicious thing that was somewhere between a terrine, a meatloaf, and a sausage. They were served with a crusty rye bread, a zingy mustard, and delicious little pickles – all made in house. Damn, make it stop! The butcher plate at “Our Meat.” Have you noticed how I’ve restrained myself from making a joke about a place called “Our Meat”? 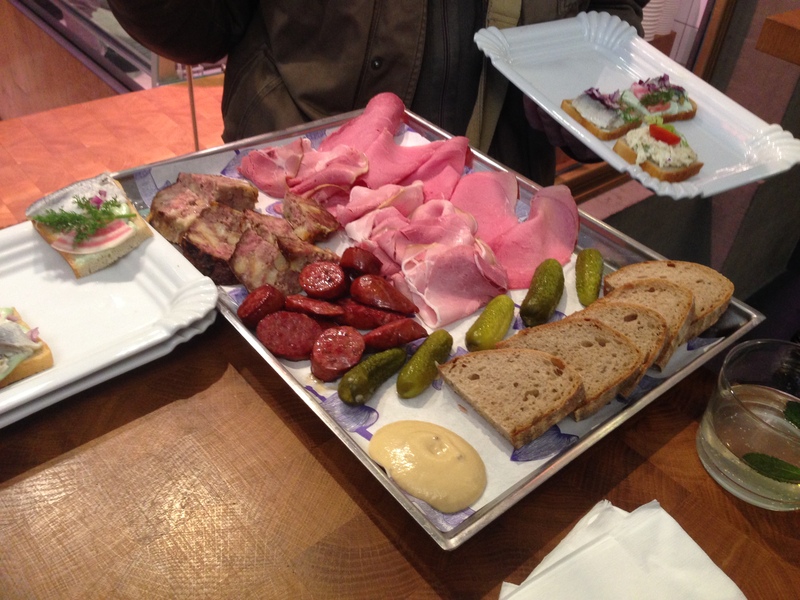 Then we were off to a charming, quiet garden café that doubles as a furniture store just off chaotic Wenceslas Square where we had red current wine and pork terrine. The square was the site of a series of anti-Soviet demonstrations and later the Velvet Revolution that produced the Czech Republic’s modern democracy. After that it became infamous for its red light district and British hooligan tourists taking advantage of $20 airfares on Ryanair, but it now seems like just another busy shopping district in a big European city. After that, we headed to Restaurant Zvonice, which sits in the belfry of the Jindrisska Tower. The tower dates back to 1475, and at almost seventy meters it’s the highest stand-alone belfry in Prague. The visit would have been worth it for the view alone, but like geese being fattened for liver-ectomies, the food kept coming. This time it was a vinegary and really delicious sauerkraut soup, an old Bohemian favorite, and I can see why. By this point we were feeling like that guy in Monty Python’s Meaning of Life, but we hadn’t even had our main course yet. For that, we were off to Café Louvre, another old Prague classic, which was a former haunt of Kafka and Einstein, among others. The main course was by far the most unusual of the day – Svíčková, a braised beef served on top of a root vegetable puree, with a cranberry compote, some fluffy Czech bread dumplings, and, strangely, a rosette of whipped cream. It was delicious but I’m still not sure about the whipped cream. After all that they had the nerve to place an aircraft carrier-sized piece of apple strudel with a small pitcher of custard crème on the side, which we ate, of course. Braised beef with dumplings and…whipped cream! Even though they were serving us what they called tasting-sized portions, by the end of the tour we were all ready to be wheeled home on gurneys. It was some of the most over the top gluttony we’ve done so far, but we got the chance to taste Prague’s greatest hits, and they were pretty terrific. Our new friend laughed at our jokes, fed us the good stuff, and sent us home happy, although if we keep eating like this, we may need to be sent home in shipping container. I had a ball in Budapest. Actually, I had a bunch of them. We were walking down the street here, minding our own business, when what should confront me but a simmering cauldron of rooster testicles. We had stumbled upon an Easter market set up in the middle of a small square not far from our apartment. There were food stalls with all sorts of delicious looking things – spring lamb turning on a spit, potatoes sauteeing in onions and goose fat, pork knuckles in sauerkraut, and lots of other light and healthy snacks. And then there was a pot of rooster testicle stew. That other stuff looked great, but how could I pass up rooster testicles and look myself in the mirror? A steaming cauldron of testicles. What would you do? I know what you would do. You would do what normal people do. You would giggle, crack a little joke, and you go about your life. Right? Well, not me. Rooster testicles aren’t just food, they’re a challenge. I pride myself on being the ever-so-slightly-more-hirsute Andrew Zimmern, the guy from the TV show Bizarre Foods. If there is some crazy weird morsel out there, chances are I’ll eat it. And there I was, staring at these tiny spherical gauntlets that had been spread at my feet (my apologies for combining a medieval warfare metaphor with a reference to male poultry reproductive organs). I could not back down. I would not back down. Why on earth was I put in this position in the first place? Apparently Hungarians either 1) are very hungry (har); 2) have an excess of roosters this time of year; 3) don’t like to waste anything, even rooster testicles; or 4) have a terrific sense of humor. They didn’t look that scary, and the pot of nuts even smelled kind of good, although Janine didn’t agree. I was standing downwind of the big vat of boiling orbs, but I suppose the cooking smells clung to my clothes a bit. Later, Janine would berate me for walking around Budapest smelling like a chicken’s jockstrap. I will admit that Marky Mark may not make Eau du Boule du Coq his next fragrance, but if you ask me she was overreacting. I think she was planning to burn my clothes while I slept, but I’m relieved to report that she restrained herself. By now you’re all dying to know how they were. Well, they were good. They came in an onion-y tomato sauce, which might be the part that Janine most objected to (well, that and the testicle part). They were, well, creamy, a bit gamey, and they were indisputably offal. I guess you could call these testicles the ultimate organ meat. Really, they were much better than you would think. Enough of this nuttiness. What are we doing in Budapest anyway? Weren’t we just in Burma? Well, yup. Apart from a brief side trip to Japan, we have managed to stay in the southern hemisphere for the winter, but we decided to take one more swing through Europe before heading home. This meant risking some cold weather, however. Going from southeast Asia to eastern Europe is a massive shift. One day, we were melting in hundred degree heat in a shorts and flip flops (the common garb for men and women alike is a light cotton longhi – a simple sarong that provides some excellent ventilation). 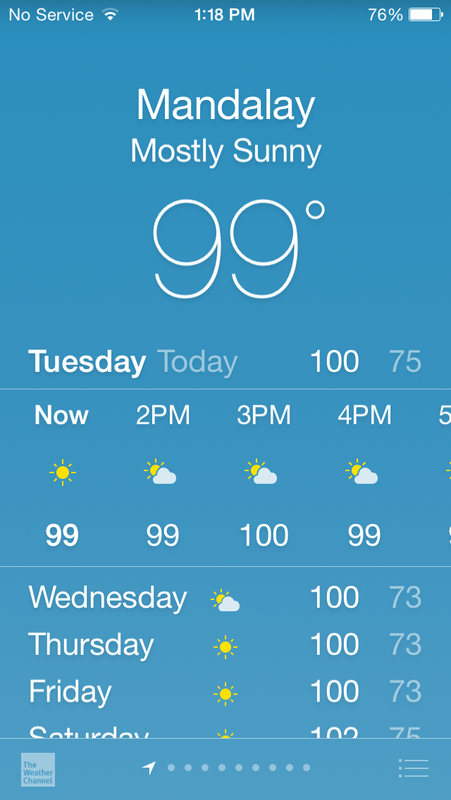 Sweating profusely (but happily) in Myanmar. Four plane flights and twenty five hours later we were standing in thirty five degrees of wind chill next to the Danube wearing all the clothes in our suitcase. Freezing our bippies off in Budapest. Janine had always wanted to see Budapest and Prague, so here we are, freezing our asses off and eating testicles. 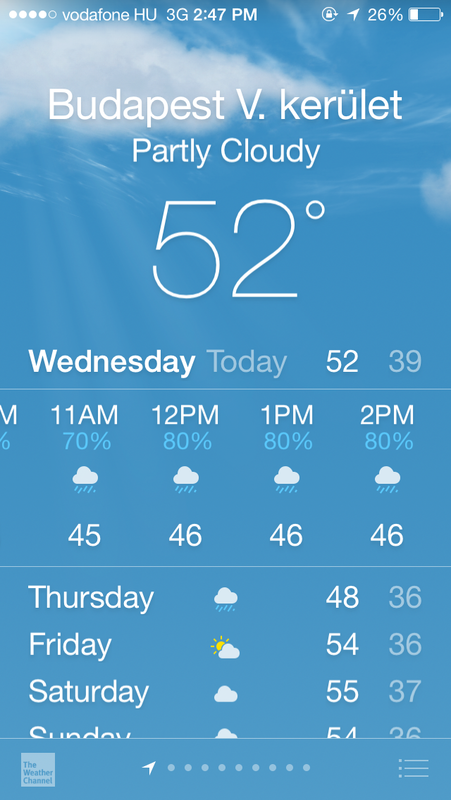 We were hoping that by April things would warm up a bit, but we were wrong. No matter, Budapest is a lovely city with lots to offer. 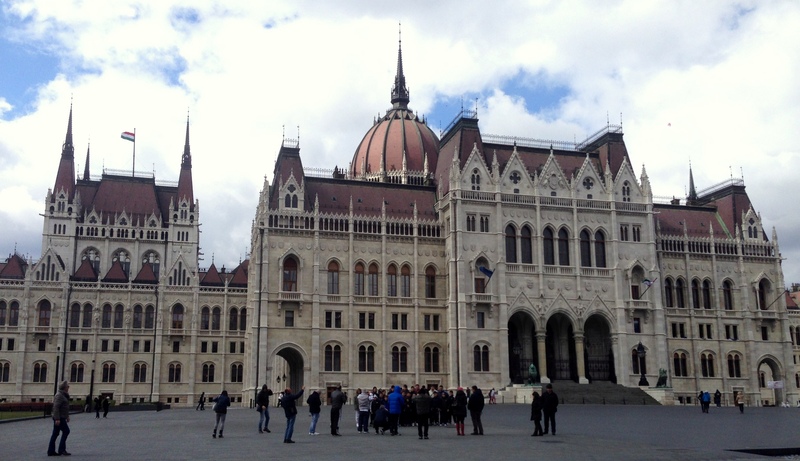 In addition to its adventurous cuisine and astonishingly cheap beer and cocktails (at a nice bar, a gin and tonic will run you about $3.50), Budapest has elegant nineteenth century architecture, a very moving and informative Holocaust museum, an old and stately Parliament building, and one of the most beautiful opera houses I’ve ever seen. 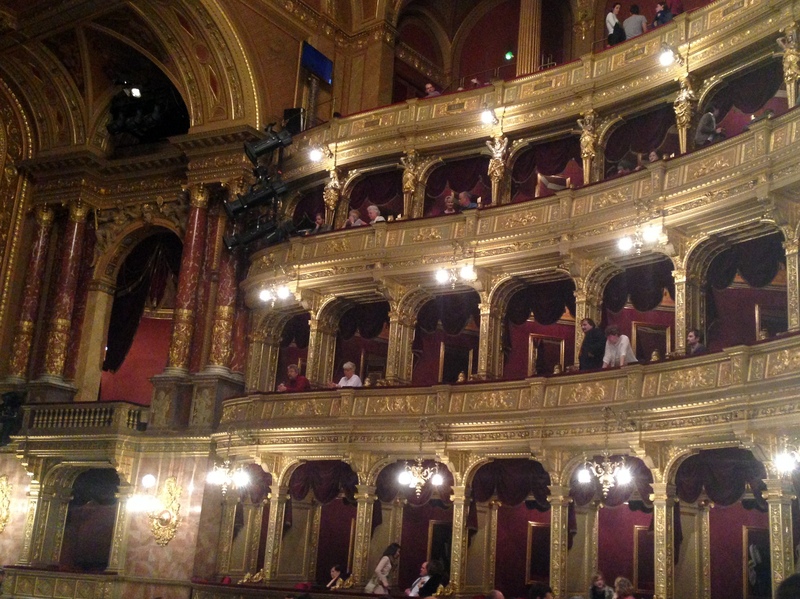 The Hungarian State Opera House is a lot nicer than its communist-era name would suggest. It’s another one of those wedding cake jewels that looks like something out of the movie Amadeus. It opened in 1884 and is said to have some of the best acoustics in the world. Janine and I have been on an opera house kick. After taking lots of opera house tours, we finally saw an actual opera in Sydney, but the Sydney Opera House is a decidedly new world creation and we hadn’t experienced old world opera the way we’re supposed to. A gorgeous opera house with amazing acoustics. We started going to the opera back in San Francisco and decided that we really like it. Operas are like broadway musicals with bigger sets, bigger casts, much bigger orchestras, less dancing, and a lot more singing. The good news was that there was an opera being performed while we were in town, there were tickets available, and they were cheap! The bad news was that the opera was Parsifal by Richard Wagner. Let’s set aside, if we can, the complications of seeing an opera by Wagner. Wagner is performed all over the place, so having outsourced my moral decision making to opera buffs who still attend Wagner in New York, San Francisco, and other places, we settled into our seats to see what the fuss was about. The thing is, we’re opera novices. What we know about opera you can put on the head of a pin. Well, Wagner is complicated, and Parsifal damn near impenetrable. What’s it about? I’m still not entirely sure, and neither, it seems, is the Hungarian State Opera. In the program notes, even they admit that “it’s difficult to pin down what the story is about.” I’ll say. It has something to do with the holy grail and the spear used to wound Christ, and it’s often performed on Good Friday, but that’s about as far as I got. I will say that it was long and that it had more false endings than the Bush family. Opera requires a lot of patience for the performers and the audience, but Parsifal really puts one to the test. Some guy would come on stage, sing a bunch of exposition for thirty or forty minutes, and then disappear for an hour or two. Where did he go? When’s he coming back? Some other guy would sing two or three lines and then be made to stand on the side of the stage watching everyone else do stuff for hours on end. Was he being punished? What about us? The first act, which clocked in at a hair over two hours, felt like a twenty two inning baseball game in which both pitchers walk the bases loaded in every inning but nobody ever scores. On the positive side I thought the orchestra was wonderful and the acoustics were indeed splendid. And if I got bored I could look at the ornate room or compose this blog post in my head. I confess that we didn’t stick it out for the whole five and a half hours, but I’m really glad we went. Like all stretching exercises, now that we’ve seen Wagner it will make all the other stuff a lot more easy.